GLOGIRLY: Photohunt: *Copper* ... and Robber? Now that BlogPaws is behind us, it's back to normal here at the Townhouse. Well, as normal as normal can be when you're living with a teenage Orange Crush. Looks a little more like *Dirty Copper* to me. If anyone needs to be cuffed here, it's a certain Food, Toy & Trophy Thief. NOT me. But Waffles is such a cute little copper! 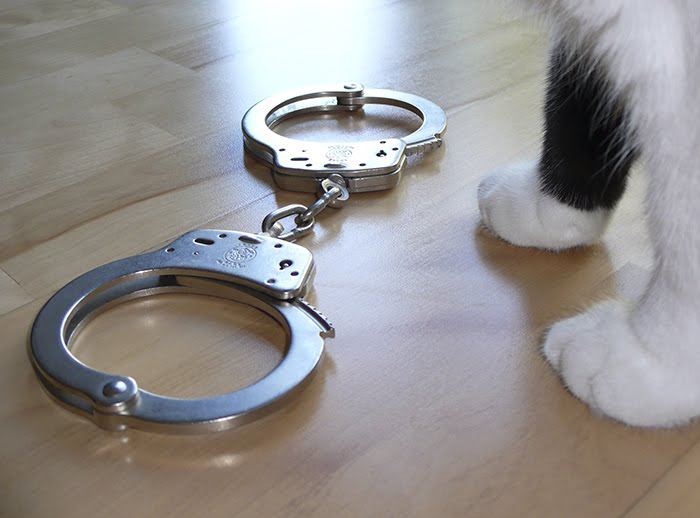 Ut oh....those cuffs look purrty serious! Um, Katie, stay away. I've heard about police abusing and harassing people... and you wouldn't want that would you? Send Waffles over here, Katie - there is a certain tortie thief who keeps stealing my dinner! Your food is NO safer with Waffles around. Can we call him a copper copper? Ok, I know it's closer to orange or gold.. but his eyes are kinda copper! One of those cuffs would make a nice collar!! Looks like the copper may come a cropper. LOL! Have a super Saturday. We think Waffles needs his bling necklace along with that hat. Really. Watch out Katie! Waffles may try to cuff you! Have a great Memoral Day Weekend! Dood, can I turn on the siren? Uh oh! Do you need some help from Officer Wally in order to catch the culprit?? 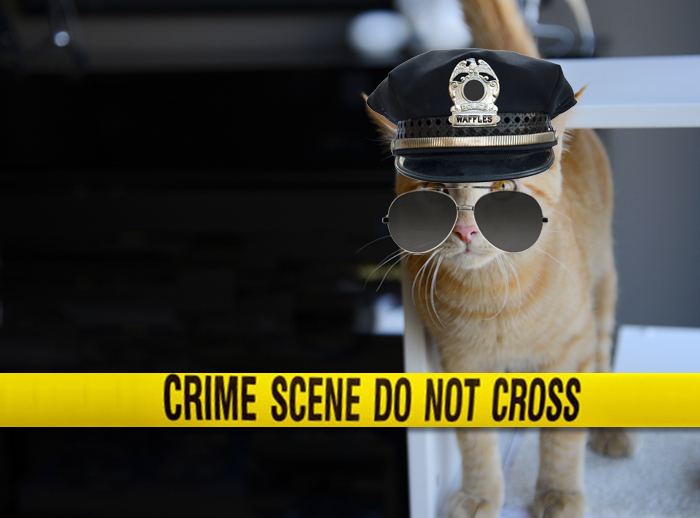 Oooooh, I lubs a mancat in uniform, MOL! i want to know why glogirly HAPPENS to have handcuffs. uhum, uhum! I was wondering that too! I decline to comment on the grounds that I may incriminate her. Or Gloman. We KNEW you'de go this route! Only we didn't expect Waffles to be the Law Enforcer...just saying. I'm confused. I thought you were a gangsta but you're actually a cop in plain clothes. I knew you weren't to be trusted. Waffles is kind of a cute "Copper"
Don't tell me he has found another way to wind you up? !